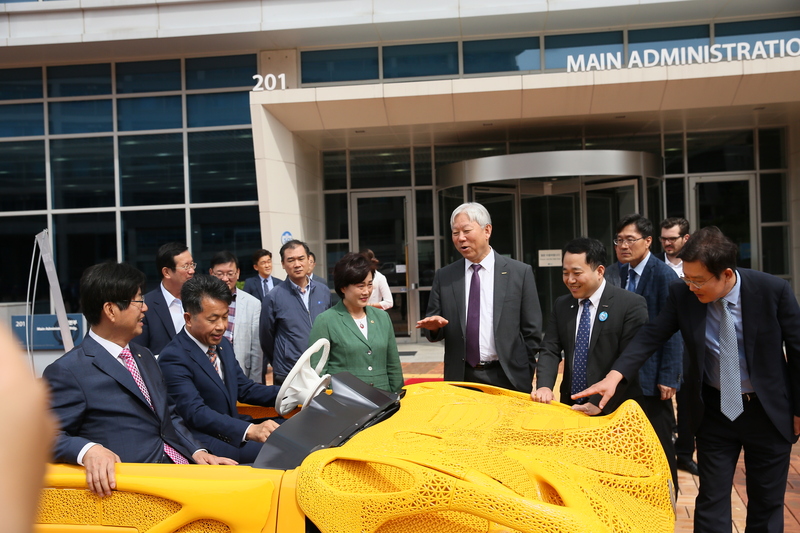 A 3D-printed electric vehicle, being test-driven by Gil-Bu Kang, a member of Korea's National Assembly. The 3D Printing Gala in Ulsan, held at UNIST from September 14 to 16, 2017. 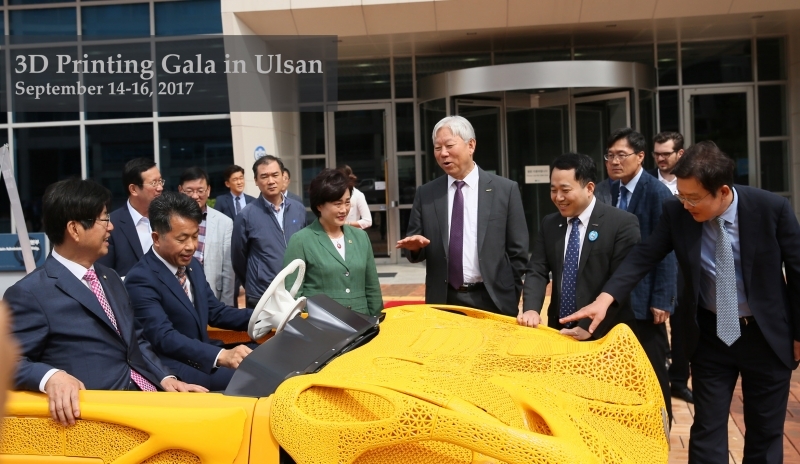 Organized by the Ulsan IT Industry Promotion Agency, a variety of events were featured at the Gala, which includes 3D Printing Industry Exhibition, a test drive in a 3D-printed electric car, the testing of 3D-printed drones, and an international seminar. The event also featured the DfAM competition, as well as the inaugural meeting of KAMUG (Korean Additive Manufacturing User Group). 3D-printed metal components are being displayed in Engineering Building at UNIST. The 3D Printing Industry Exhibition introduced 3D printing-based materials, equipment, softwares (SW), and other related areas. It was participated by a total of 62 companies and organizations, both domestic and international. The exhibition booths were packed with various 3D-printed products, which include toys, industrial parts, and dental models. During the course of the event, UNIST unveiled its own electric car and drones, made using its 3D printing technology and offered the public an opportunity to test drive them, 150 times a day. The OR Laser, the leading manifacturer of laser machines and professional laser equipment in Germany, came into spotlight by introducing their state-of-the-art 3D printers at the exhibition. An international seminar on 3D printing to discuss the current and future potential of 3D printing technology. The seminar was held for the purpose of establishing the convergene of 3D printing and the manufacturing indusry, as well as for international collaboration on 3D printing. Hosted by Professor Namhun Kim, Director of 3D Advanced Additive Manufacturing Center, the seminar also featured presentations on a variety of topics by Professor Kamran Mumtaz of the University of Sheffield in the United Kingdom. Other participants include Vice Chairman Conaldi of Edision Welding Institute (EWI) in the United States, as well as nine other experts from industry, academy, and research. A 3D printing competition, named Design for Additive Manufacturing (DfAM) was also held during the event, showcasing a wide range of creative possibilities afforded by today’sadvanced 3D printing technology. 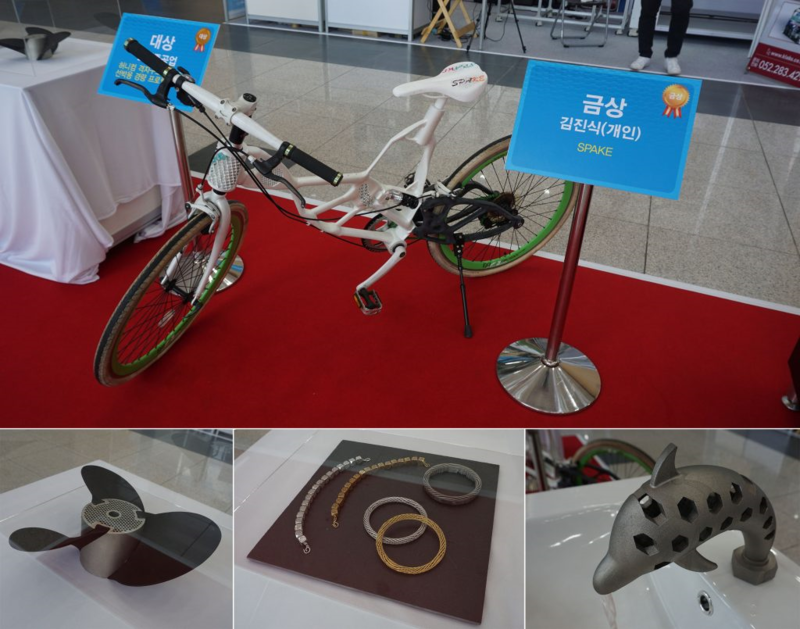 The ‘Spark Bike’, submitted by Mr. Jin Sik Kim of UNIST Research Supporting Team won the gold prize. The grand prize went to the “Honeycomb lattice structured, light-weight propeller hubs for ships “. The award ceremony was held shortly after the opening ceremony of the 3D Printing Gala in Ulsan. The winning works from the 2017 DfAM competition. Shown on the bottom left is the light-weight marine propeller hub. 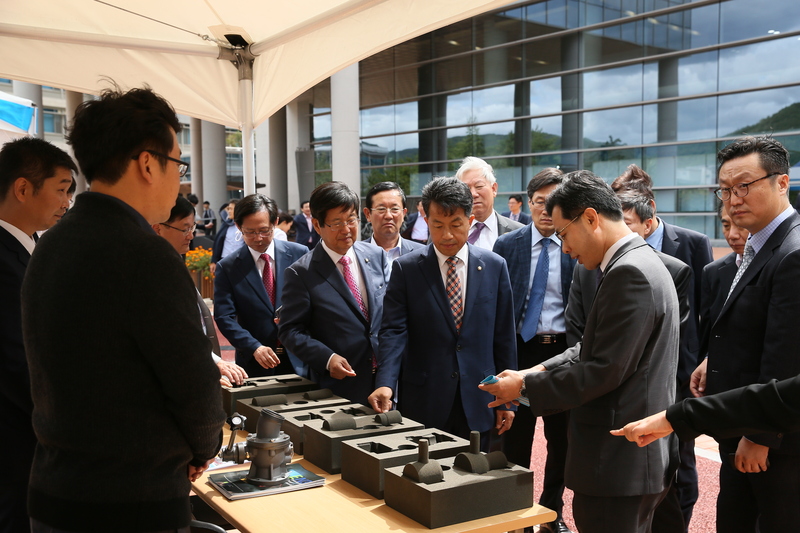 The last day of the event featured the celebration of the inaugural meeting of K-AMUG (Korea-Additive Manufacturing User Group). Since last May, K-AUG has set a goal to contribute to the innovations in manufacturing processes by developing technologies, related to 3D printing, as well as through the exchange of information and experts. 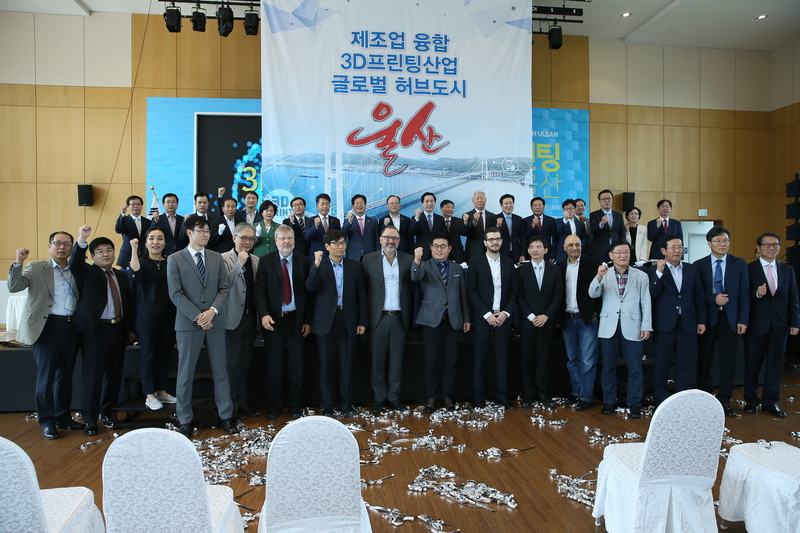 The inaugural meeting of K-AMUG (Korea-Additive Manufacturing User Group) at 3D Printing Gala in Ulsan. 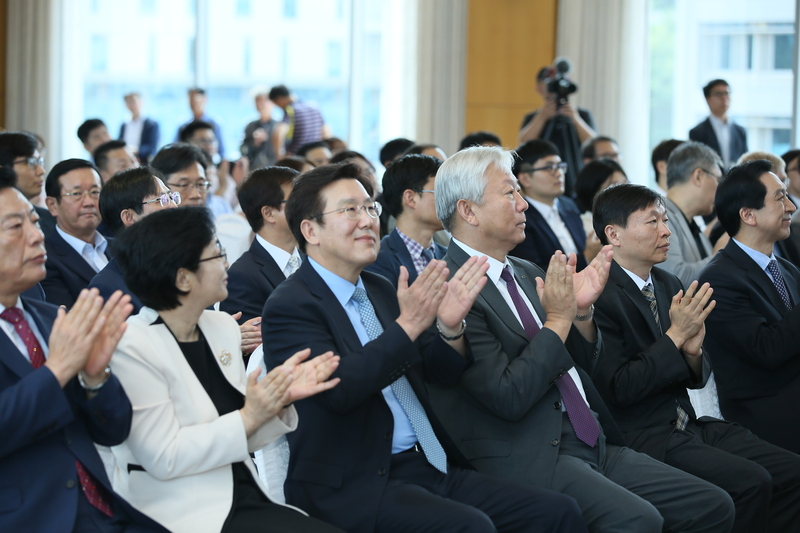 At the inaugural meeting, Professor Seung Hwan Ju of Inha University was appointed as the first president of the K-AMUG. Key executives include UNIST, Korea Institute of Industrial Technology (KITECH), Korea Electronics Technology Institute (KETI), and Korea Institute of Ceramic Engineering and Technology (KICET). as well as local 3D printing menufacturers (EN3, Centrol, Winfosys, DaeGoon Tech, HAPSIVA, CIEITECH, 3D TECHNOLOGY, and Participate). 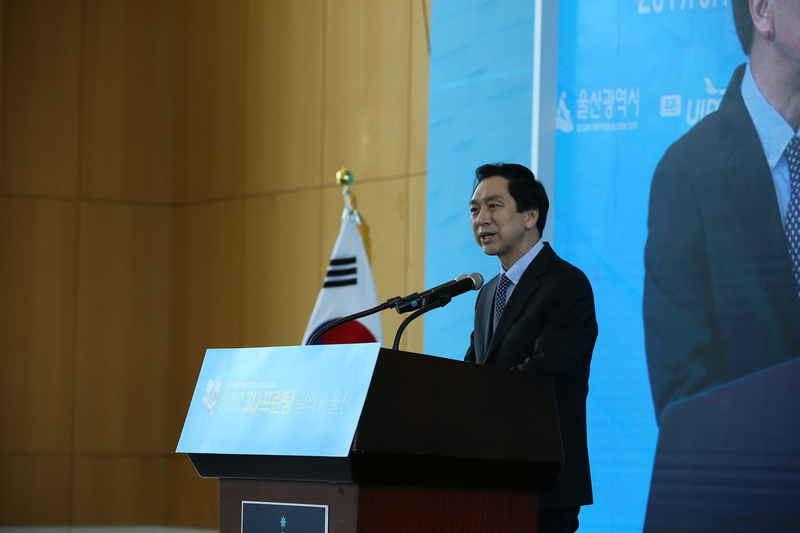 The executive office of K-AMUG will be located in Ulsan Venture Building and will be relocated to the Knowledge Industry Center in 2020.